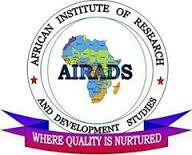 African Institute of research and development studies (AIRADS)- Courses, Website, Intake, Contacts. African Institute of research and development studies- courses, website, contacts. A comprehensive list of all short courses, certificate and diploma courses offered at African Institute of Research and Development Studies (AIRADS). African Training Center for Research and Technology- Fees, website, courses, intake, contacts. Shujaa Training Institute of Development Studies- Fees, website, courses, intake, contacts. Harvard Institute of Development Studies- Courses, Fee Structure, Account Number, Application Forms, Contacts. Institute of Energy Studies and Research- Fees, website, courses, intake, contacts. Rongo University college- courses, application form, intake, contacts.